Route locations have all been approved! Want to volunteer during the event? RSVP and/or attend the Poker Run for location details. as we will have limited change on hand. -We cannot accept ATM/Credit Cards. eat with one of the other merchants. -The event is based on giving proceeds to charity. photos/videos of the route/stop locations! 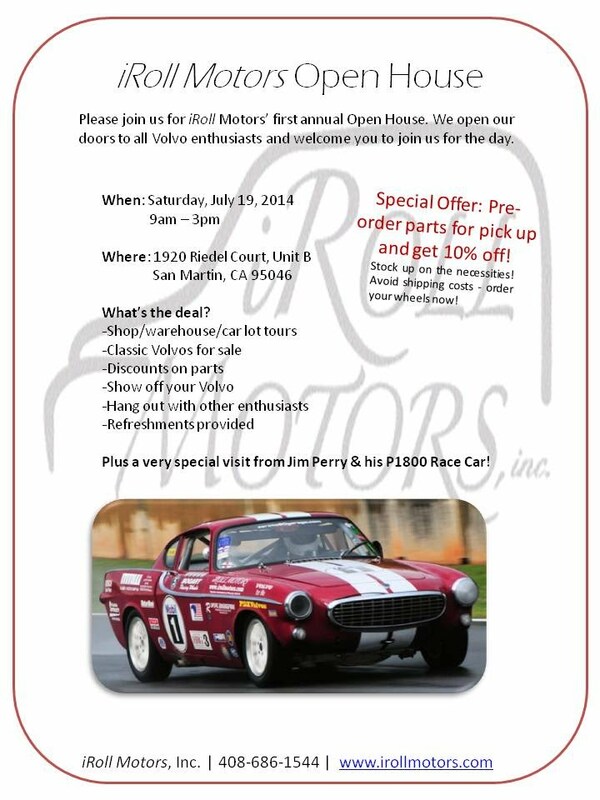 Poker Run for location details. tables, get BBQ's ready, clean up parking lot, etc. Let Mark know if you can help for a few hours. *Food: Bring your own food and BBQ. lot of extras from people, but bring something...Pot-luckish. charcoal, but bring an extra bag of charcoal if you have one. *Also bring your own water/sodas, snacks, hats, sunscreen, chairs, etc. *If you want alcoholic drinks, you gotta bring your own and be responsible about it. *Chassis dyno (Dynojet) offering 3 pulls for $60. most Volvos at a "party rate." Pricing TBD. Last year prices included: back window, rear door windows, and 2 small rear windows. Prices will be more to add front side windows or to remove old tint etc. This is a great deal as this guy really knows what he is doing. First come, first served. Let me know if you are planning on getting your sled tinted. The tint guy trying to figure out how many of his guys to keep on that evening. with Mark Baldwin, Sac Volvo Club Planning Committee or via the Contact Us Form. with Elizabeth, SacVCOA Planning Committee. Please e-mail Elizabeth, SacVCOA Planning Committee, if you are interested in volunteering for the Poker Run. -We need at least 5-10 volunteers to staff the stop locations. -Please have a cell phone so we can contact you while at the stop location (for event details, etc.). will be closing Thursday, April 3, 2013 at 9 p.m. Pacific. Thursday, April 3, 2014 at 9 p.m. Pacific. -Registrations accepted on day of event. Volunteers are needed. Please e-mail Justin Lee, GGVCOA President, if you are interested in volunteering. First Shift: 7:15 a.m. to 9:00 a.m.
Second Shift: 9:00 a.m. to 10:30 a.m.
First Shift: 10:45 a.m. to 11:15 a.m.
Second Shift: 12:55 p.m. to 1:30 p.m.
First Shift: 8:45 a.m. to 11:30 a.m. Perfect weather, perfect cars! Sunday, April 6, was a perfect California day for the 16th annual 2014 Davis meet Weekend, hosted by the Golden Gate and Sacramento Chapters. The event took place at Davis Central Park, courtesy of the City of Davis Parks Department. Davis is centrally located, about 75 miles from San Francisco and just 15 miles from Sacramento, the state capital. The park is downtown, near UC Davis, and was picked, in the late 90s, as the perfect venue for the Davis Meet. Golden Gate Chapter President, Justen Lee, with volunteer family members, arrived at the park before dawn to set up and double-check the parking areas. Parking was on pavement-only this year due to heavy rains affecting the grass. As if by magic, eager and efficient volunteers appeared almost instantly; a welcome sight for the struggling staff! Set up was rapid and Lee's astute parking strategy promised success for the multitude of Volvos soon to arrive. Dawn seemed to break simultaneously with the first arrivals-- a parade-like procession of gleaming Volvos and their rightfully proud owners. A steady stream of older, newer, restored, and in-progress cars, included models 544, 120 (two wagons), 140 (one wagon), 1800 and 1800 ES, 740, 780, 240, C70, C30, XC90, 850 Sedans, S and V Series cars, and the popular 202 utility vehicle. Not counting cars in the swap area or street parked, there were over 100 creme-de-la-creme Volvos exhibited. If cars could talk, these cars would have bragged about endurance, quality, and expert design! The air was soon full of friendly excitement. Everything seemed synchronized, like a well rehearsed play. A gentle breeze cooled the sunny day, stirring the myriad trees that lined the streets and adorned the beautiful park lawns. Attendees enjoyed the park's permanent amenities, which include a large metal pavilion for shade or shelter, fountains, tables, benches, bathrooms, and a children's play area. Soon hoods were opened, finishing touches were added, and vendor tables were piled high with raffle prizes, gift certificates, posters, T-shirts, decals, give-aways, and demo-displays. Ever-loyal sponsors, like ipd, GROM Audio, Elevate, Lawrence Volvo, and many others were there, insuring the show's great success. 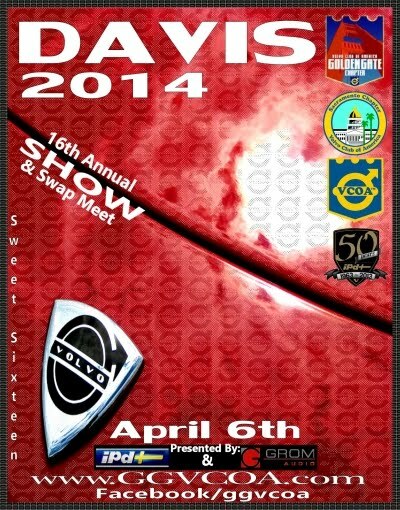 Ipd sponsored a special award and livened up the vendor area with raffle prizes, demo items, and outstanding vehicles. Elevate also sponsored a special award and, like last year, donated numerous raffle prizes and gifts. All sponsors demonstrated their enduring devotion to VCOA with their unparalleled generosity and enthusiasm. The weekend kicked off with Saturday's Poker Run, hosted by the Sacramento Chapter. This well-attended event was organized and staffed by Elizabeth Brown and Turbobricks forum members. The Poker Run was highly successful, followed by the traditional Rehab Party at Mark Baldwin's shop. As usual, Mark, who is past Sacramento Chapter President, went all out for the party and once again, it was a triumph. Poker Run results were based on "Standard Poker Hand Rankings," which go from highest to lowest: royal flush, straight flush, four-of-a-kind, full house, flush, straight (run), three-of-a-kind, two pair, pair, and high card. Happy winners were: 1) Asher Miller (straight), 2) Taro Unterburger (triple queens), and 3) Colin Clark (pair of aces). Just as happy was Jesse Coss for worst hand (7 high). Of course, everyone who attended the Poker Run and Rehab Party were winners in having a lot of fun! Poker run participants were still in high spirits when they merged with Sunday's car show crowd. While everyone mingled, visited, and chose their favorite cars, countless raffle winners were announced. Logo T-shirts, posters, water bottles, decals, and gift certificates went off the tables in rapid succession and T-shirt give-a-ways literally flew threw the air when Justin tossed them to the crowd. Finally, the moment everyone was waiting for-- the People's Choice Awards were announced. Mike and Michele Parmley of Bakersfield, Calif., not only won first place in the 444/445/544/210/1900 class, but also won the Best of Show Award. Aaron Mowbray of Santa Cruz, Calif. won the Elevate Choice Award and Bob Freedkin of Carmichael, Calif. won the ipd Choice Award. George Haigh of Everett, Wash. was presented with a GROM Audio Award for best technology/sound. Year after year, staff, sponsors, volunteers, and attendees make the Davis Meet a merry and memorable experience. Congratulations and thank you to everyone who made this year's weekend one of the best! Perfect weather, perfect day, perfect Volvo! Royal Flush, Straight Flush, Four of a Kind, Full House, Flush, Straight (Run), Three of a Kind, Two Pair, Pair, High Card. View Larger Map (in new tab/window). RSI BBQ and drag racing info based on 2013 event. Check for BBQ event updates at RSI links above. Check for drag racing updates at the Turbobricks forum. then 90 db limit until closing. -Reservation under "Volvo Club of Sacramento"
near the shower facilities and store at the lake."